HTML tags are always treated as inline content (regardless HTML semantics). Definition at line 371 of file Comment.h. Definition at line 376 of file Comment.h. Definition at line 390 of file Comment.h. Definition at line 395 of file Comment.h. 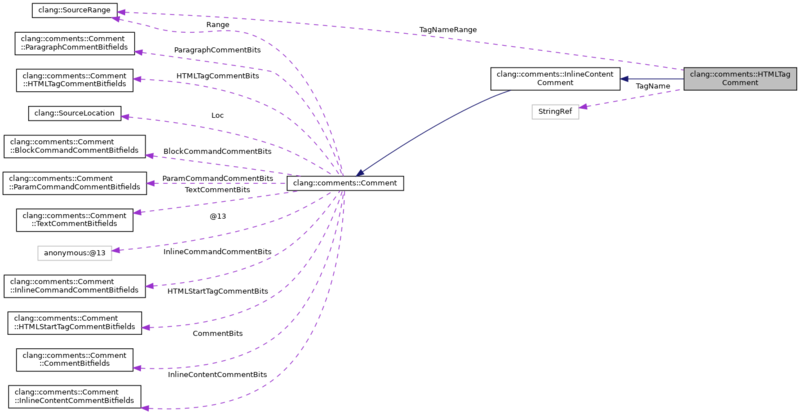 Referenced by clang::comments::Sema::actOnFullComment(), clang::comments::Sema::actOnHTMLEndTag(), clang::comments::Sema::actOnHTMLStartTagFinish(), clang::TextNodeDumper::visitHTMLEndTagComment(), and clang::TextNodeDumper::visitHTMLStartTagComment(). Definition at line 397 of file Comment.h. Definition at line 403 of file Comment.h. Definition at line 407 of file Comment.h. 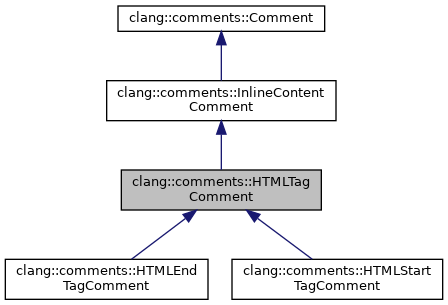 Referenced by clang::comments::Sema::actOnFullComment(), and clang::comments::Sema::actOnHTMLEndTag(). Definition at line 373 of file Comment.h. Definition at line 374 of file Comment.h.